After getting arrested for drinking and driving in Statesville, NC, it is essential that you have a DWI defense lawyer on your side. Driving while impaired in Statesville, North Carolina is an offense that is associated with many severe penalties. If you are convicted this crime, you may be required to pay a significant fine, spend time in jail, and perform community service. Your license may also be revoked, and your car insurance rates will likely skyrocket. After getting arrested for drinking and driving, it is essential that you have a DWI defense lawyer on your side. When this occurs, I strongly encourage you to turn to me, W. Sloan Goforth, Attorney at Law, for assistance. I will tenaciously advocate for your best interests and ensure that no evidence that could mitigate the charges brought against you is overlooked. As your DWI defense lawyer, I will work to make sure that the penalties you are charged with get as close to the minimum penalties for drinking and driving as possible Additionally, I will negotiate penalty alternatives, like community service and limited driving privileges, on your behalf, if you wish. Minimizing the severity of the penalties you face after getting arrested for DWI isn’t my only goal as your DWI defense lawyer. From the initial consultation to the day your case is heard in court, I will be there for you to listen to your concerns, provide you with reassurance, and answer your questions. Don’t let one mistake harm your finances, freedom, and reputation. 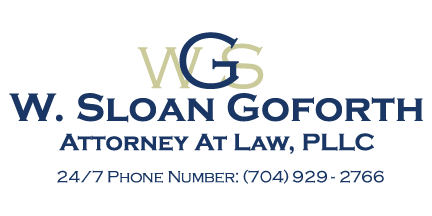 If you were recently arrested for driving in an impaired state, give me, W. Sloan Goforth, Attorney at Law, a call to schedule a free legal consultation.